The sphinx has had a long history of secrecy and intrigue, being viewed by many cultures as guardians of knowledge and as speaking in riddles. Originating in Ancient Egypt, the sphinx as a mythical creature existed in Ancient Greece and Mesopotamia, was revered by the later Western World, and to this day still exists in Eastern cultures. The sphinx has no history of real living existence, but exists only in art and literature, representing human desire for that which is greater than themselves, both in terms of the body and the mind. Yet the sphinx also embodies paradox, beautiful and alluring, she is also dangerous even deadly; the guardian of knowledge and threat to evil, encountering a sphinx is described as confusing and destructive. Ultimately the sphinx represents human desire and ability to penetrate the mysteries of the universe, while warning us to venture there at our own risk. Perhaps the sphinx guards such knowledge until such time as true human beings, worthy and capable of understanding truth, appear on the earth. The sphinx varies in physical features, but is almost always a composite of two or more animals, and some versions are part-human part-animal. In ancient Egypt there are three distinct types of sphinx: The Androsphinx, with the body of a lion and head of person; a Criosphinx, body of a lion with the head of ram; and Hierocosphinx, that had a body of a lion with a head of a falcon or hawk. 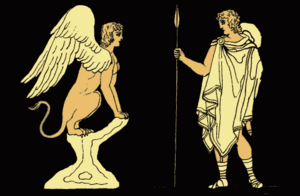 In Greek mythology there is less variation: a winged lion with a woman's head, or a woman with the paws, claws, and breasts of a lion, a serpent's tail and eagle wings. Found throughout history, in tales and in art, the sphinx always possesses an enigmatic character. Alluring, knowledgeable, and dangerous, the sphinx is to be approached with caution. The sphinxes of ancient Egypt were regarded as iconic images. Usually, the sphinxes appeared as giant statues with the faces of pharaohs and almost always were regarded as protectors of temples or sacred areas. To what extent the sphinx played a role in ancient Egyptian mythology is an issue of debate. While the sphinx is not the only combination of animal and man to emerge in the religious art of the time, it may be one of the first, pre-dating all other anthropomorphic images of animal deities. Famous Egyptian sphinxes include the alabaster sphinx of Memphis, localated within the open-air museum at that site; and the ram-headed sphinxes (in Greek, criosphinxes) representing the god Amon, in Thebes, of which there were originally some nine hundred. 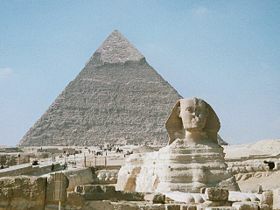 The most famous and largest of sphinxes is the Great Sphinx of Giza. This famous Egyptian sphinx is known as Sesheps, the "Great Sphinx of Giza," and is situated on the Giza Plateau on the west bank of the Nile River. The Great Sphinx is a statue with the face of a man and the body of a lion. Carved out of the surrounding limestone bedrock, it is 57 meters (260 feet) long, 6 meters (20 feet) wide, and has a height of 20 meters (65 feet), making it the largest single-stone statue in the world. Blocks of stone weighing upwards of 200 tons were quarried in the construction phase to build the adjoining Sphinx Temple. It is located on the west bank of the Nile River within the confines of the Giza pyramid field. The Great Sphinx faces due east, with a small temple between its paws. The Great Sphinx was believed to stand as a guardian of the Giza Plateau, facing the rising sun. It was the focus of solar worship in the Old Kingdom, centered in the adjoining temples built around the time of its probable construction. Its animal form, the lion, has long been a symbol associated with the sun in ancient Near Eastern civilizations. Images depicting the Egyptian king in the form of a lion smiting his enemies appear as far back as the Early Dynastic Period of Egypt. 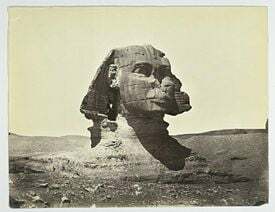 The face of the Great Sphinx is believed to be the head of the pharaoh Khafra, or Khafre, (often known by the Greek version of his name, Chephren) or possibly that of his brother, the Pharaoh Djedefra, which would date its construction from the fourth dynasty (2723 B.C.E. – 2563 B.C.E.). However, there are some alternative theories that re-date the Sphinx to the pre-Old Kingdom, and, according to one hypothesis, to prehistoric times. ...the royal son, Thothmos, being arrived, while walking at midday and seating himself under the shadow of this mighty god, was overcome by slumber and slept at the very moment when Ra is at the summit (of heaven). He found that the Majesty of this august god spoke to him with his own mouth, as a father speaks to his son, saying: Look upon me, contemplate me, O my son Thothmos; I am thy father, Harmakhis-Khopri-Ra-Tum; I bestow upon thee the sovereignty over my domain, the supremacy over the living ... Behold my actual condition that thou mayest protect all my perfect limbs. The sand of the desert whereon I am laid has covered me. Save me, causing all that is in my heart to be executed. Ramses II may have also performed restoration work on the Sphinx. However, it was not until 1817 that the first modern dig, undertaken by Giovanni Battista Caviglia, uncovered the Sphinx's chest completely. The entirety of the Sphinx was finally dug out in 1925. 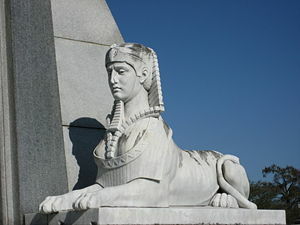 While it is more than likely that the Greeks acquired the idea of the sphinx through cultural diffusion, they nonetheless incorporated it to a large degree into their written mythology and gave it its name (a potential combination of the Greek verb σφινγω — sphingo, meaning "to strangle" and the name Φιξ — Phix. There was a single sphinx in Greek mythology, a unique demon of destruction and bad luck, according to Hesiod a daughter of Echidna and of Orthrus or, according to others, of Typhon and Echidna. She was represented in vase-painting and bas-reliefs most often seated upright rather than recumbent. Hera or Ares sent the sphinx from her Ethiopian homeland (the Greeks remembered the sphinx's foreign origin) to Thebes, where she guarded the entrance to the city, asking all those who passed her famous riddle "Which creature in the morning goes on four feet, at noon on two, and in the evening upon three?" All those who answered wrong were killed, and it was not until Oedipus came along and solved the riddle that the besieged city was liberated, making Oedipus king (the answer to the riddle is man; a baby crawls when young, walks on two legs as an adult, and uses a cane in old age). Bested at last, the sphinx then threw herself from her high rock and died. An alternative version tells that she devoured herself. The exact riddle asked by the sphinx was not specified by early tellers of the story and was not standardized as the one given above until much later in Greek history. Thus Oedipus can be recognized as a liminal or "threshold" figure, helping effect the transition between the old religious practices, represented by the sphinx, and new, Olympian ones. In contrast to the sphinx in Egypt, Mesopotamia, and Greece, where the traditions have been largely lost due to the discontinuity of the civilization, the traditions of the "Asian sphinx" are still very much alive. The earliest artistic depictions of "sphinxes" from the South Asian subcontinent are to some extend influenced by Hellenistic art. But the "sphinxes" from Mathura, Kausambi, and Sanchi, dated to the third century B.C.E. until the first century C.E., also show a considerable non-Hellenist, indigenous character. It is therefore unlikely that the concept of the "sphinx" originated through foreign influence. In South India the "sphinx" is known as purushamriga (Sanskrit) or purushamirukam (Tamil, meaning human-beast). It is found depicted in sculptural art in temples and palaces where it serves an apotropiac purpose "warding off evil," just like the "sphinxes" in other parts of the ancient world. According to tradition, it is said to take away the sins of the devotees when they enter a temple and to ward off evil in general. It is therefore often found in a strategic position on the gopuram or temple gateway, or near the entrance of the Sanctum Sanctorum. The purushamriga plays a significant role in daily as well as yearly rituals of South Indian Shaiva temples. In the sodasa-upacara (or 16 honors) ritual, performed between one to six times at significant sacred moments throughout the day, it decorates one of the lamps of the diparadhana or lamp ceremony. And in several temples the purushamriga is also one of the vahana, or vehicles of the deity during the processions of the Brahmotsava or festival. In the Kanya Kumari district, in the southernmost tip of the Indian subcontinent, during the night of Shiva Ratri, devotees run 75 kilometers while visiting and worshiping at twelve Shiva temples. This Shiva Ottam (or Run for Shiva) is performed in commemoration of the story of the race between the Sphinx and Bhima, one of the heroes of the epic Mahabharata. In Sri Lanka, the sphinx is known as narasimha or “man-lion.” As a sphinx it has the body of a lion and the head of a human being, and is not to be confused with Narasimha, the fourth reincarnation of the deity Mahavishnu; this avatara or incarnation is depicted with a human body and the head of a lion. The "sphinx" Narasimha is part of the Buddhist tradition and functions as a guardian of the northern direction and was also depicted on banners. In Myanmar, the sphinx is known as manusiha and manuthiha. It is depicted on the corners of Buddhist stupas, and its legends tell how it was created by Buddhist monks to protect a new born royal baby from being devoured by ogresses. Nora Nair and Thep Norasingh are two of the names under which the "sphinx" is known in Thailand. They are depicted as upright walking beings with the lower body of a lion or deer, and the upper body of a human. Often they are found as male-female pairs. Here too it serves a protective function. It is also enumerated among the mythological creatures that inhabit the ranges of the sacred mountain Himmapan. Not all human-headed animals of antiquity are sphinxes. In ancient Assyria, for example, bas-reliefs of bulls with the crowned bearded heads of kings guarded the entrances to temples. In the classical Olympian mythology of Greece, all the deities had human form, though they could assume their animal natures as well. All the creatures of Greek myth that combine human and animal form are survivals of the pre-Olympian religion: centaurs, Typhon, Medusa, Lamia, and so forth. In Hindu tradition, one of the avatars of Vishnu was the Narasimha which means "man-lion," although this avatar had a human body and the head of a lion. Beyond the monuments in Egypt, the sphinx has been depicted in art for centuries. Some of the most famous depictions, ranging from ancient Greece to Asia, are variations of Oedipus' encounter with the sphinx. 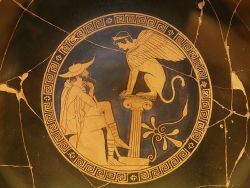 Some depictions show a sphinx in a position of power and wisdom, looking down on Oedipus as he tries to solve the riddle, while others depict the battle of minds as an epic, mortal fight. In any case, the artistic iconography of the Greek legend represents man's ability to penetrate the mysteries of the world, to use his mind in epic measures. The revived Mannerist Sphinx of the sixteenth century is sometimes thought of as the French Sphinx. Her lovely coiffed head is erect and she has the pretty bust of a young woman. Often she wears pearls. Her body is naturalistically rendered as a recumbent lion. Such sphinxes were revived when the grottesche or "grotesque" decorations of the unearthed "Golden House" (Domus Aurea) of Nero were brought to light in late fifteenth century Rome, and she was incorporated into the classical vocabulary of arabesque designs that was spread throughout Europe in engravings during the sixteenth and seventeenth centuries. Her first appearances in French art are in the School of Fontainebleau in the 1520s and 1530s; her last appearances are in the Late Baroque style of the French Régence (1715–1723). ↑ Winston, Allen. 2003. "The Great Sphinx of Giza: An Introduction." Retrieved January 23, 2007. ↑ Mallet, D. Translation. Retrieved February 22, 2007. ↑ Demisch, Heinz. 1977. “Die Sphinx.” Geschichte ihrer Darstellung von den Anfangen bis zur Gegenwart. ↑ Deekshitar, Raja. The Sphinx in Early Indian Art. Retrieved February 9, 2007. ↑ Thep Norasri. Himmapan.com. Retrieved February 9, 2007. ↑ "Sphinx." Encyclopedia Britannica. Retrieved January 23, 2007. This page was last modified on 21 October 2015, at 21:05.